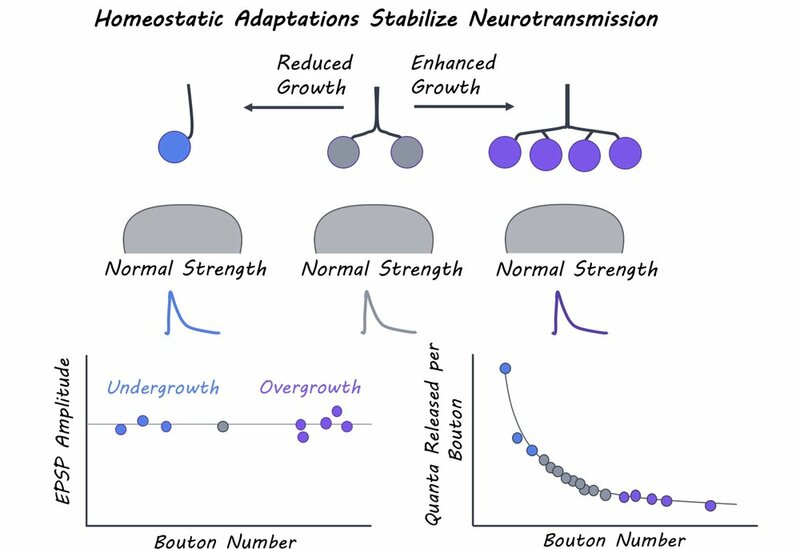 Over the course of development, neural synapses (junctions where neurons communicate with their targets) grow, shrink, change in numbers, and undergo structural changes, but synaptic function or strength remains stable. Even in the presence of genetic mutations, synaptic strength often remains stable and within a narrow physiological range. It is currently not clear how synapses maintain consistent levels of activity despite the structural variability introduced during development or by mutations. This week in The Journal of Neuroscience, Goel and colleagues investigated the structural and functional neural mechanisms that help stabilize synaptic strength in mutant Drosophila (fruit flies) with disrupted synaptic growth. Aberrant synaptic growth and structure is associated with a variety of neural diseases. The authors first identified 300 genetic mutations linked to neural diseases and obtained Drosophila stocks that carried those mutations (mutant lines). They characterized the neuromuscular junction – a type of synapse connecting motor neurons and muscles in each of these 300 mutants. In particular, they measured synaptic growth based on a) the number of synaptic boutons (axon terminals) and b) synaptic strength by electrophysiologically recording the amplitude of excitatory post-synaptic potentials (EPSPs) evoked by stimulation. Mutant lines were selected if they had drastically altered synaptic growth but normal synaptic strength. To determine how synapses with enhanced or reduced growth maintain their strength, the authors investigated the relationship between structural and functional properties of synapses in mutant lines. Structural properties included parameters like the size of boutons and the number and area of active zones (synaptic regions where neurotransmitters are released) at a synapse. Postsynaptic parameters included the amount of postsynaptic neurotransmitter receptors. Functional properties included the quantal content of presynaptic neurons (i.e. the number of synaptic vesicles released upon stimulation) and the amplitude of the spontaneous EPSP events that occur in the absence of any stimulation. The authors systematically examined these properties in mutant lines with reduced and increased synaptic growth and compared them to wild-type Drosophila. The authors systematically probed synaptic growth and function in the 300 mutant lines and identified 12 with over-grown (too many boutons) or under-grown (fewer boutons) neuromuscular junctions, and 40 with reduced synaptic strength (EPSP amplitude) compared to wild-type Drosophila lines. For the mutant lines that had reduced EPSP amplitude, no change in synaptic growth was observed, indicating that defects in synaptic function occurred independent of altered growth. Conversely, normal synaptic strength was observed in the 12 mutants with dramatic changes in synaptic growth. The authors thus proposed a “homeostatic model” for maintenance of synaptic function, whereby neurotransmitter release at each bouton is reduced at synapses with more boutons but greater at synapses with fewer boutons. These mutants interestingly employed three main strategies to maintain normal synaptic output. When bouton numbers were massively reduced, either bouton size was enlarged to accommodate more neurotransmitter release and maintain normal synaptic strength or spontaneous EPSP amplitude and receptor levels were enhanced to increase postsynaptic sensitivity and compensate for reduced neurotransmitter release. In contrast, synaptic overgrowth mutants exhibited an increase in the total number of neurotransmitter release sites but each of these individual sites were smaller, leading to an adjustment in presynaptic release per bouton. Thus, homeostatic mechanisms stabilize overall synaptic strength while permitting substantial flexibility in synaptic growth. This study is the first to illustrate the adaptive pre- and postsynaptic mechanisms that help maintain synaptic strength despite large differences in synaptic growth. These findings enhance our understanding of how neural function remains stable while the underlying synaptic structure is constantly changing during development, maturation, aging, and even disease. Goel et al. A screen for synaptic growth mutants reveals mechanisms that stabilize synaptic strength. The Journal of Neuroscience (2019). Access the original scientific publication here.